Because of our love of Richard Scarry, I was quite excited to find a “perfect book” for our little engineer – Poem-Mobiles: Crazy Car Poems written by Patrick Lewis and Douglas Florian and illustrated by Jeremy Holmes. We admired inventive text and elaborate illustrations in this poetry book and were kind of sorry that the book ended so soon. We got our copy from the library, but Poem-Mobiles would make a terrific gift for a young car enthusiast, and I am seeing us purchasing it to give as a present very soon. I kept some empty egg shells from making Mexican brownies before Easter, and we made several egg people. Smarty really enjoyed making her character all girly with a beautiful bow. 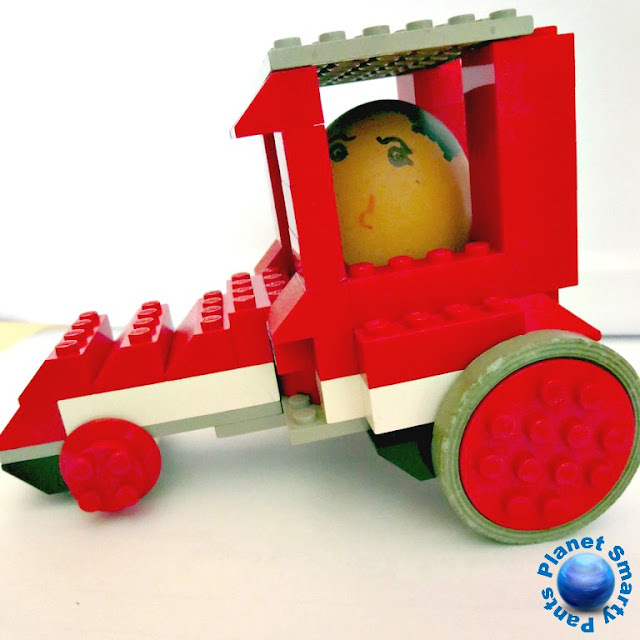 When we were done giving character to our eggs, I suggested an engineering challenge – create a safe and fast Lego car for your Egg driver. Our Master Lego Builder (aka my husband) took on this challenge as well, and we all headed upstairs to our sizeable collection of loose Lego bricks. Smarty dived into her project with abandon and built her standard “box car”. Obviously, her egg driver is using the sixth sense to navigate. I used a Duplo platform and went with an “Egg Motorized Carriage” motive. Our Master Builder was the only one building an aerodynamic car. The top was built after this shot to keep an egg driver safe. Duplo plastic wheels are very slow – my racer was dead last. You need to make sure to align the wheels and pick the best possible wheels – Smarty’s car kept veering to the side. The size of wheels does matter, Master Builder’s car easily won the race with its bigger back wheels. Building Lego cars to race is a blast, and we should definitely do it again! And here is the winner! More Engineering Fun for Kids? Follow Natalie Planet Smarty Pants's board For future engineers on Pinterest. 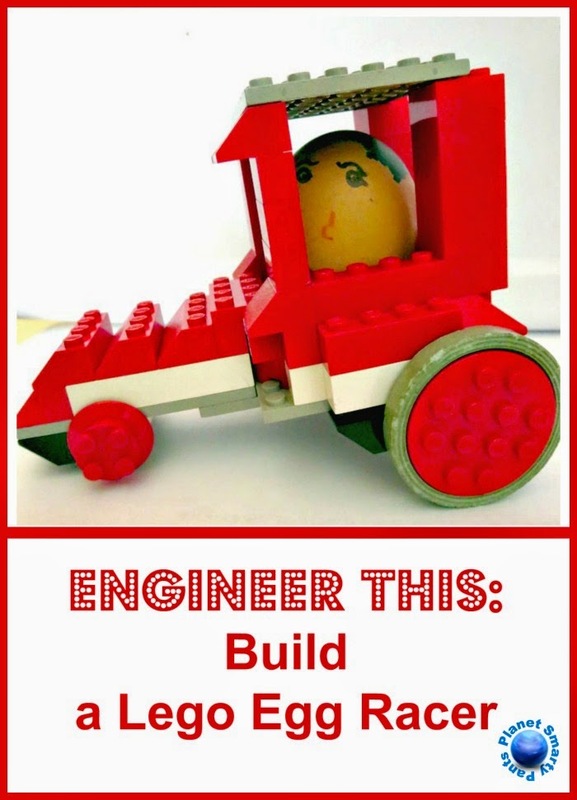 Have you built Lego cars from loose bricks and tested them against each other? So much to love about this! I definitely want to check out the crazy car poems book. And legos for racing eggs? Just too awesome! I LOVE your racing eggs. What fun! We did Lego egg cars once a few years ago.... Our eggs did not survive. And I LOVE your activity here! You do such a great job with challenging your daughter in science. I have much to learn from you! Legos are sure to make poetry more exciting for the kids that think poetry is "boring". The egg racers are just too cool by the way! This is a great idea! I think I'm putting it into my rainy day file for my son! These are such a wonderful idea! Thanks for sharing! Did you put the racers on a gentle slope and use gravity? I don't think these are motorized?